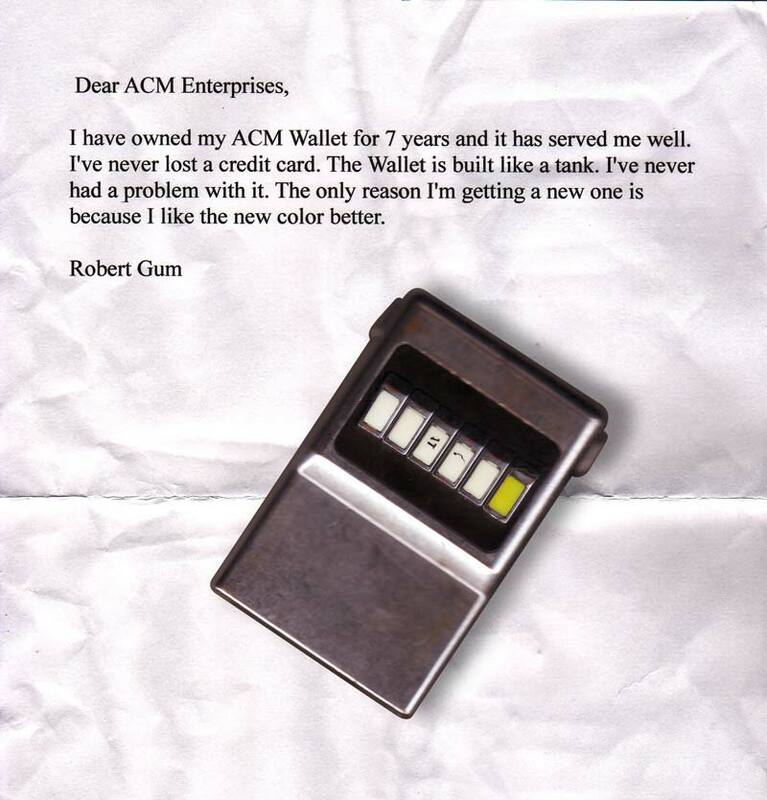 I have never be disappointed with the ACM wallet. Each is superbly manufactured and protects my credit card information with RFD qualities. If I was to collect money from everyone that tells my husband "how cool and awesome the wallet is", I'll be a millionare. As many of the reviewers have said, it's true - everywhere I go people want to know what it is in my hands and where can they get one. It's the biggest people magnet product I've ever seen - it attracts so much attention & keeps doing so even after 3 years of owning the silver 6-card wallet!! Received your wallet for my birthday. Every cashier is totally fascinated by it. Great invention. This is the handiest gadget I have ever owned! My most frequently used cards and license are at my fingertips, and I haven't misplaced a single card since I bought this and used it! Wow. I was sold as soon as I saw it. Everywhere I go people ask me about it. It's the best thing I have ever bought online. As corny as this all sounds it's true. My mom wants one and my friends want me to get them one. Buy it. Reviewer: Karem from Galloway, N.J. I could never find my ATM card when needed. Now ALL my cards are organized. Great gadget!!! Was worth buying!! I love this little wallet, it fits my cards and it's so handy to keep in my handbag. I bought a couple more for some friends for Christmas. Thanks ACM Guys! Wonderful product. Since I have arthritis in my hands, fumbling for cards is no longer as issue! Thanks!! This is so simple and easy to use. Everyone who sees it comments on what a clever card carrier it is. Sent one to my friend out of state and she just called telling me how much she liked it. You have this item listed in the wrong area - women love it! This is a fun little gizmo. It really lightened the load I was carrying in my purse because I had to pare it down to the basics - cash and cards. It's a little inconvenient not being able to carry change, but it's worth it because you have to cut out the crud and only have the basics (which is really all you need). Reviewer: Mary from Richmond, VA. This is the most wonderful thing ever made. Everywhere I go people ask about it and where did I buy it. A great invention. Thanks for everything! The wallet is great and I will def pass it on to my friends! At dinner Friday night the waitress said it was the coolest thing she's ever seen. I think it is one of the best inventions ever! I really like the ACM! My wife gave it to me for Christmas and I use it every day. People are alwasy asking where I got it from. I really appreciated the professionalism when we talked the other day. We love both the ACM's. Even my husband who had a difficult time 'giving up his wallet.' He thought he would have a hard time conforming with it in his pocket but it did so beautifully. I even tried it out in the back pocket of my jeans (even though you advised against it) and could not tell it was there. I can't answer the 'customer service' part of the questionnaire because I haven't needed to contact them. I like it because it attracts a lot of attention. The comments are always the same such as "Where did you get THAT?" and "Hey, that's a cool gadget" and "That's really cool!" I like it very much just the way it is. I get lots of inquiries and compliments everywhere I use it. Please send the ID's and thanks for the offer. Hi there, Your prouduct is GREAT! I've had lots of questions about it, and everyone wants to know where I got mine. I will gladly take you up on your offer to replace the button pads with the newly re-designed pads! That would be fantastic if you could do that for me. Thank you for notifying me that you recognized the problem, and then corrected it-----that is rare in business these days. Thank you very much. I look forward to getting the replacement button pads. I saw this product advertised on television and immediately knew this was an item I wanted. Plus, I knew this item would be a great gift for my Dad, Brother, Sister, and Husband. This is a truely unique item that is both useful and convienient. Also, this item can be concealed and is easier to carry than a big wallet or just putting your credit card in your pocket. I purchased an ACM about 3 weeks ago. Love it! It is FANTASTIC!! Everywhere I go when I make a purchase, someone *always* asks me, "What's that???". And then when I tell them, they say, "Neat! Where do I get one?". And of course, I can never remember the phone number and I never carry anything with me that I can give them on how to get one. Those "Hey where'd you get that cards" are excellent! I'll carry those with me so that I can give it to people who are truly interested in buying one. I could have sold 25 of these by now-----easily-----just from doing my normal shopping. (Note: One guy thought it was a "phaser" from Star Trek, and another person thought it controlled the alarm system on my car! HAH!). The sweet was to be the wallet, and you sent along a Werther’s caramel!!!! This made me SMILE ALL DAY after opening my package. By the way, I absolutely love my new ACM wallet even thought it looks the same as the first two, which are still being used. I WAS the one in the supermarket, coffee shoppe, fast food, etc. digging in my purse for payment while everyone in line was tapping their feet. Well, after receiving the first ACM wallet, never again! That has been over about 15 years! It keeps most everything organized, and my purse is A LOT LIGHTER. I would like to ask, if you ever consider putting out tabs for like CAPITAL ONE, CITI, CHASE, etc. ?